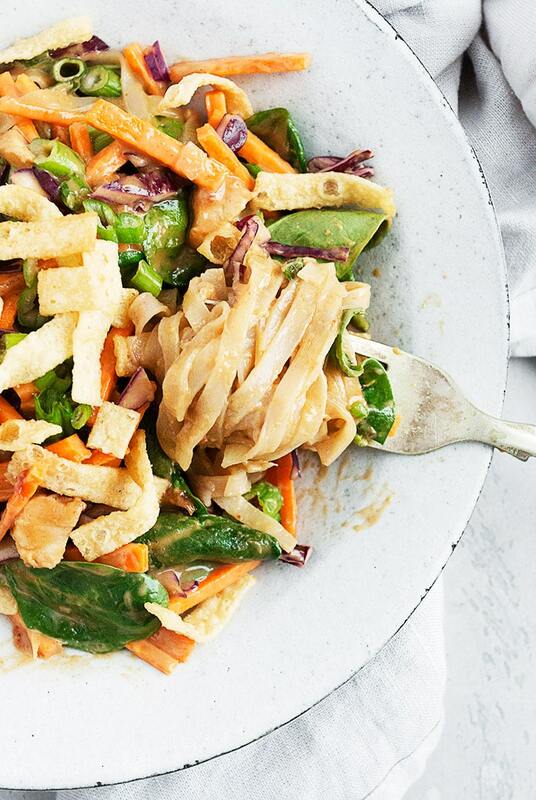 This Buddha Bowl with Chicken is a copycat of the delicious Freshii™ version. Lots of vegetables and rice noodles in a spicy peanut sauce. For those nights when I want take out, but don’t want the “out” part, I have learned how to recreate my favourite Buddha Bowl at home. 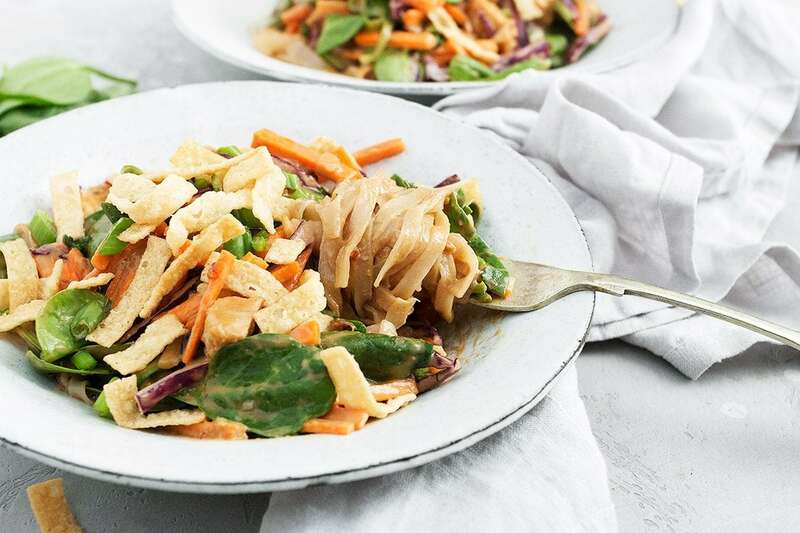 This Buddha Bowl has carrots, red cabbage, green onion and spinach, all tossed with rice noodles and a spicy peanut sauce. On top is a generous sprinkling of wonton strips. If you are a fan of the original, I think you’ll find this one comes pretty darned close! If you have no idea what Freshii™ is, no worries, you’ll enjoy this bowl anyway. It’s quick, easy, delicious and healthy-ish. As noted above, if you want the exact Buddha Bowl ala Freshii™ simply swap out finely chopped raw broccoli for the spinach. The recipe as written includes “extra sauce”. If you’re not wanting it as saucy as I like it, simply half the sauce recipe. The rice noodle “cakes” I use come in a bag of about 12 little rice noodle nests. Each nest is 1.6 oz. If you are starting with rice noodle sticks, use about 4 oz. Go for the thicker, fettuccini-width rice noodles for the best results. I like to break the noodles in half before soaking if they are long. It’s just easier to eat with shorter noodles. Top Tip! Make this dish super quick and easy by starting with pre-cooked chicken strips. Simply dice and warm in a skillet with the sauce for a few minutes. I like to do all my vegetable chopping first. Then I set the noodles to soak. Next I mix up the peanut sauce and dice the chicken. 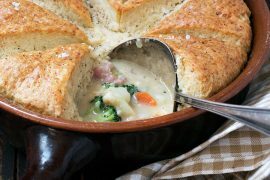 Heat both in a skillet or saucepan until the sauce melts and is smooth. Add the softened noodles to the skillet and cook in the sauce for a minute, then toss it all together with vegetables in a large bowl. If you can’t find Wonton Strips, you could fry up your own from wonton wrappers or I think the fried chow mein noodles would make a decent substitute. Cutting carrots into matchsticks doesn’t need to be a time-consuming adventure. Simply follow these easy instructions for an easy and painless way to cut carrots into matchsticks. Peel carrot and cut into 1- inch long pieces. On a cutting board, with a sharp knife, carefully cut the rounded side off the right side of the carrot. Place the cut, flat side down and make thin, 1/8-inch or less slices in from the side until you reach the centre. Flip the carrot again, placing the flat edge at the centre down and make more slices as above, flipping to the flat edge once more. Take your carrot “planks” and using the tip of a sharp knife, cut into super thin slices. (You can stack two planks together and cut, but any more than that and they get difficult to keep together as you slice). If you have a ready source for Wonton Strips, you are ahead of the game. I couldn’t find any locally, but discovered them on Walmart Canada’s Online Shop. I simply ordered a few bags and had them shipped to my local Walmart for pickup. There are probably other online sources as well. Amazon.com has them as well (linked up below). Wonton Strips are easily available via Amazon.com! Great for this dish, but also on salads and in soups. 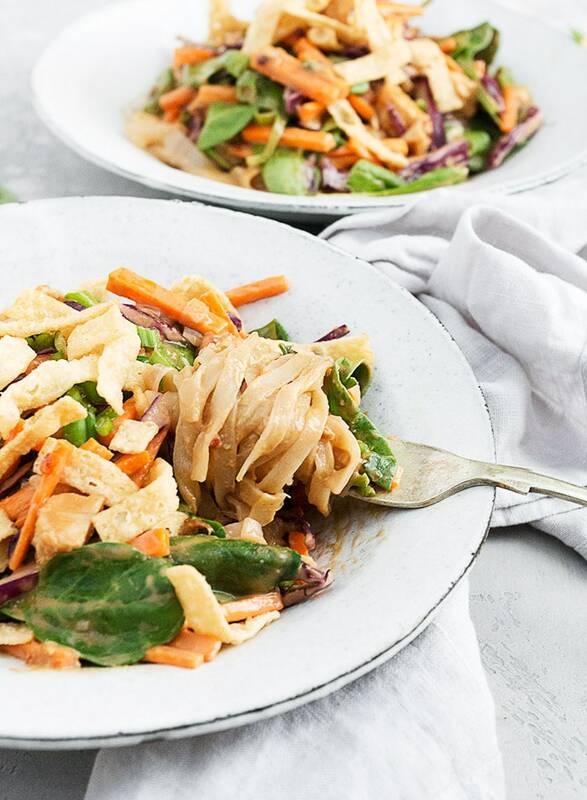 Rice noodles in a spicy peanut sauce, with vegetables. Copycat Freshii&trade; recipe. Prepare vegetables and place into a large bowl. Set aside. Set rice noodles to soak in a big bowl with your hottest tap water. (I like to break in half before soaking, if long, as it makes the finished dish easier to eat). Prepare peanut sauce by stirring together all the ingredients. Set aside. 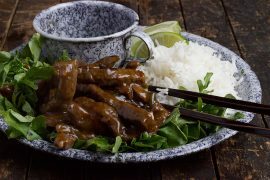 Add peanut sauce to a skillet or large saucepan. Heat over medium heat until melted and smooth. Add diced cooked chicken and cook, stirring, until chicken is warmed through. Drain rice noodles and add to skillet. Toss to coat noodles in sauce. Pour noodles over vegetables in large bowl. Toss to combine then transfer to serving bowls. Garnish with wonton strips, additional green onion and some finely chopped peanuts, if you like. *You can cook a boneless chicken breast to use here, or start with left-over cooked chicken. Chicken from a rotisserie chicken or store-bought cooked chicken strips that you dice up. 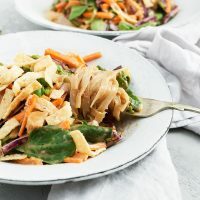 **If starting with natural peanut butter, use the same amount, but perhaps add a pinch of salt to the sauce and consider replacing 1 Tbsp or so of the water with oil, so the sauce has a good texture for sticking to the noodles. So glad you enjoyed it, Katie! One of my favourites :) Thanks! We made this at home tonight. Seriously great recipe Jennifer! Turned out brilliantly. So glad to hear, Glenn :) Thanks! No Freshii’s here Jennifer, but this looks like something I’d totally enjoy, especially if I could make it at home. Love that peanut suace! 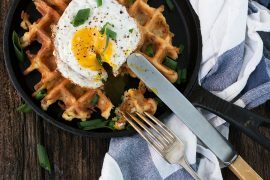 I could enjoy this lovely and chealthy dish for breakfast lunch and/or dinner! It looks fantastic! I can’t resists peanut sauce either, Tricia :) Thanks! I can certainly see why you would want to create this dish yourself, it sounds delicious. I am always in the mood for any dish that has peanut sauce! This looks amazing! Pinned!